Welcome to Que It! Here is a quick rundown of what you need to know to get started. Feel free to contact us at info@urbanbyte.io if you have any questions, or would like to make suggestions on how we may be able to improve our product. The first step will be to link your Dropbox account to the app. Once you tap the link Dropbox button you will be prompted to link your Dropbox. Once Line-It is linked to your Dropbox account, you are able to start using the application. Create New Show: The next step is to load your script which should be placed in your Dropbox in PDF form. When you choose the Create New Show button a dialog will appear which allows you to pick a PDF file from Dropbox and import it into Que-It. If you need to do any edits to the file itself it should be done before importing it into Que-It as it cannot be edited or replaced once it is imported into Que-It. Create your Cue Lists: Choose the Cue List Setup button, then choose a list marked as Available. From here you will be prompted to name the list, choose the prefix the color used to render the list, and whether you would like to use numbers or letters. You have two options for managing stand-by’s: you may use Que-it’s auto stand-by feature which will automatically add stand-bys to call cues in the list, or you may use an other cue list if you want finer control of your stand-bys. 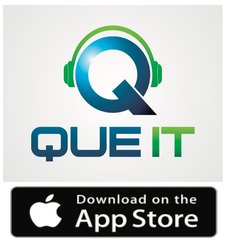 Additionally Que-It offers the ability to automatically number (or re-number) any cue list. Show Setup: Show Setup contains common show information. Here you can select a cue list and add contact information for company members associated with that list. You can also add information related to the venue. One quick note about the venue: the venue contains the show name. This is the same text that is used to save your files. When a file is saved Que-It will automatically append a timestamp to it to help you differentiate between versions of the show. Page Setup: We acknowledge that the page numbers of your PDF and the page numbers printed on the script might not always match up. For example, say a script was scanned and the first page of the PDF is actually page 5 of the script. You can account for that here by updating what we call the page mapping. To page map, exit the setup page by selecting the script button in the upper right corner of the setup screen. Using the gray navigation arrows in the upper left and right hand corners of the screen, make your way to the page you want to start your updated numbering from. Next, return to the setup page and choose the Page Setup button. In the text field, type the page number you would like this page to be. Line-It will automatically update the numbering of all the pages before and after it. You are now ready to begin creating your prompt script. Head to the script by using the script button on the upper right corner of the screen. Now we would like to point out the features on the tool bar on the bottom of the screen. Bookmarks: We got bookmarks. On the bookmark dialog enter the name and the page you want to bookmark then tap the Add Bookmark button to save it. Want to go to a bookmark? Just select the bookmark from the bookmark picker and tap Goto Page. Add a Cue: Select this tool to add a cue to the script. First draw the cue line on the page with your finger. The “prompt” will appear where your finger starts and the text will start where your finger lifts. After you lift your finger, a dialog will appear to enter additional data. You will need to setup some cue lists before you can add a cue. A quick note about drawing cue lines: some prefer a stylus instead of their finger. Do what feels right for you. Que It will work with either. Search: The search tool allows you to search for specific cue numbers or letters in a cue list of your choice. Just start typing and it will start searching. Once you find your cue, just tap the Goto Page button to advance to that page. You may also just type in a page number if you want to skip to a specific page in your script. Delete a Cue: This tool is used to delete a cue. To select the cue you want to delete, tap on the bullet point of the cue line. If multiple cues are close by, you will be asked which one you want to delete. You cannot delete a Standby. They are always tied to the cue. Edit a Cue: If you already added a cue and want to update it, this is the tool for you! Just tap on the bullet point of the cue and the edit dialog will appear before you. If you have a Standby that is combined with another (which we’ll cover next), you can use this tool to break them back apart into individual Standbys. Move: To move a cue, first select it, then re-draw the position with your finger just like you did when you added it. If you want to fine- tune the position, you may use the arrows to “nudge” the cue into the perfect spot. Anytime you want to deselect a cue, just tap anywhere there is not already a cue. The export function saves the show and its cues into a Que-It show file (.qsf) to Dropbox. This is perhaps one of the most convenient features of Que-It. If you share the Dropbox folder you saved the show to, other can import your cues into their instance of Que-It. To import a Que-It show file, first select the file in Dropbox then tap load. It is worth noting that the Dropbox view only display folders and .qsf files. You can also save your marked up script to a PDF file. This process is identical to exporting the show file: browse to the location you want to export it to and tap Export as PDF. Que It will save the show to your iPad anytime it enters the background (i.e., you press the home button). If you would like to save the show to your iPad manually, tap Save Show to iPad. The date and time the show was saved is displayed just below the button.